Our thanks go out to the 447 kids, 359 volunteers, 46 parents, and 20 teachers and administrators who joined us last Saturday for our January Reading Clubs! With Winter Recess still in session last week, that was a lot of children who woke early and came to their schools after a three-week break! In addition to receiving a free book, one lucky student at each of our seven schools also went home with a refurbished computer. Their looks of delight were priceless! Our February 8th Reading Clubs are just over three weeks away, and we need you to make our "Friendship and Family" reading clubs memorable! Please take a moment to join our February 8th Facebook Event. Your friends will be able to see that you're attending the reading clubs, and you can help spread the word by inviting them to join, too. After you join, be sure to go to our website and sign up with us. Thanks, and we hope you can join us at our next reading clubs on February 8th! 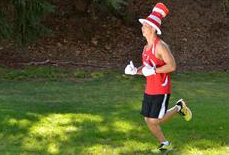 - Run the ASICS LA Marathon with Reading to Kids!